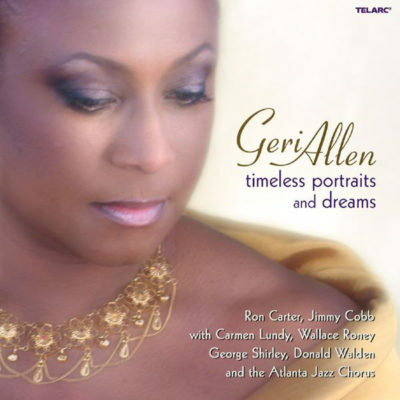 Geri Allen’s musical interests prove to be quite diverse in Timeless Portraits and Dreams, delving into jazz, spirituals, sacred works and originals, accompanied by two of the most in-demand veterans, bassist Ron Carter and drummer Jimmy Cobb, throughout most of the release. Allen”s stunning solo opener “Oh Freedom” segues directly into another fine work, “Melchezedek,” which showcases both Allen and Carter in the solo spotlight, with wordless vocals by the Atlanta Jazz Chorus adding background color. Singer Carmen Lundy and the chorus are on hand for the spirit-filled “Well Done” and Allen’s gorgeous ballad “Timeless Portraits and Dreams.” Other vocal tracks include two features for tenor George Shirley, including “I Have a Dream” (from Mary Lou’s Mass composed by Mary Lou Williams after the assassination of Dr. Martin Luther King, Jr.) and a vigorous treatment of the piece considered as the Black National Anthem, “Lift Every Voice and Sing.” Trumpeter Wallace Roney (Allen’s husband) smolders in Allen’s tasty post-bop vehicle “In Real Time” and makes a belated entrance in the tense, strident tribute “Our Lady (For Billie Holiday).” Allen throws the listener a curve with her well-disguised introduction to the trio arrangement of Charlie Parker’s “Ah-Leu-Cha” and uncovers a neglected gem in Lil Hardin Armstrong’s ballad “Just for a Thrill.” While some jazz fans may prefer to hear Geri Allen in a strictly instrumental setting, they will miss out if they fail to investigate these stimulating sessions.